There are many online comments on this innovative little replacement laptop hard drive from Seagate, now in its third generation. Purchasers post remarks ranging from extreme satisfaction to total failure. I chose to evaluate this product for its splendid archive purposes, not as a new internal drive. For testing purposes I placed the SSHD into NewerTech’s Voyager, the toaster-like drive insertion dock with several efficient interfaces for different cable connection options. My data transfer copies were to and from my speedy computers: Retina MacBook Pro with internal SSD, and MacPro with internal spinning hard drives (HDD). Comparisons were made to USB3 and FireWire 800 external sealed drive units, both SSD and HDD, from Seagate and Other World Computing (OWC). Seagate’s SSHD mounts promptly from the Voyager, faster than all competing drives. The SSHD is a a hybrid, integrating, in Seagate’s words, NAND flash with traditional hard drive storage to create a hybrid drive with the speed of solid state and the capacity of a hard drive. Make sure you are sitting down when you price a 1TB all-SSD replacement drive. They are easily five times as expensive as Seagate’s SSHD. Data transfers to and from our evaluation SSHD are close to three times faster than with HDD, and a zippy twice the duration of my available SSD external unit. There is a lot to like about this product, and very little to dislike. Seagate is both an industry leader and a cutting-edge drive developer, with three year warranties and very competitive pricing. It is possible to purchase empty drive enclosures, from OWC and other companies, that will house an SSHD and allow you to use it as a standard external drive. Not everyone cares for messing around with bare exposed drives and Voyager toasters. Purchasers who choose to replace aging, failed, slow, or low-capacity internal HDD with this SSHD will be pleased with Seagate’s service and support, when needed. I have used it with success, both as a customer and as a member of the media. Below are sample comparison data transfer tests. 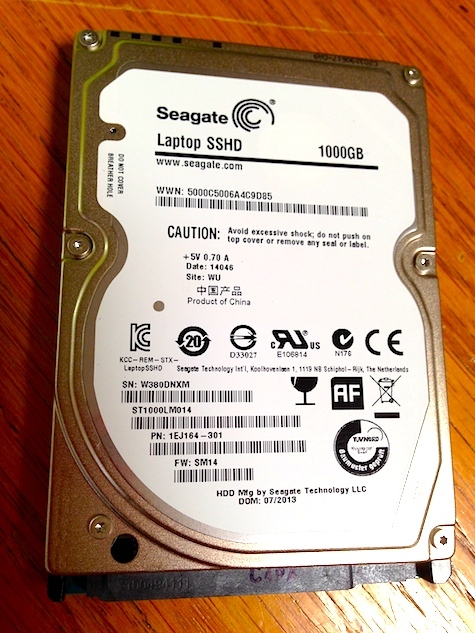 I recommend Seagate’s 1TB SSHD, and I currently use it for all my music and video archiving. Control experiment baseline: USB3 out from Seagate Backup Plus Portable Drive to FireWire 800 in to SSHD on NewerTech Voyager; both are connected to MacPro. Result: 19:09 minutes. Typical user test: USB3 out from SSHD in NewerTech Voyager to USB3 in to MacBook Pro. Result: 6:50 minutes. Power user test: USB3 from MacBook Pro to USB3 in to OWC Mercury Elite Solid State Drive. Result: 3:15 minutes. The same 41.06GB combination audio and video 121 files were copied in all three tests. When the low price of SSHD versus expensive all-SSD is factored in, Seagate’s SSHD compares very favorably.